Moving Guru » Moving Guide » How Much Does Move Out Cleaning Cost? Is cleaning your place worth the price? If your rental deposit was only a couple hundred dollars, then maybe not. 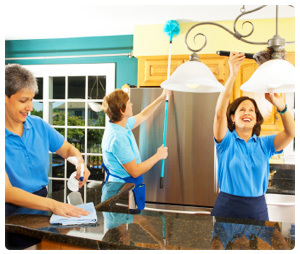 Cleaning services can provide deep cleans for your old home. Move out cleaning costs somewhere between $150 and $250 on average, will $200 being the rough price for a 1,000 sq. ft. home. Of course, if your carpet is heavily soiled, or you need a clean deeper than the Mariana Trench, then the price might go up. Here’s a breakdown of what, roughly, you can expect to pay. You decide whether it’s worth it. As stated above, on average, basic cleaning (dusting, mopping, scrubbing, vacuuming) will run you about $200 for a 1,000 sq. ft. place. Some companies’ prices might depend on the number of rooms, not square footage, but prices should remain fairly consistent. However, if you need additional services, then the total price might jack up like a rabbit on crack. Carpet Cleaning – Anywhere between $75 and $200 for a whole house; otherwise, $.25-.50 per sq. ft. is a good rule of thumb. Furniture – Expect at least $50 and at most $100 to de-stain and de-stench a couch. Windows – About $5 per window, $3 per screen. If they’re wall-size windows, or difficult to reach, expect prices to rise. Polishing/Waxing – Floor waxing prices generally range from $.25-.50 per sq. ft. Sometimes companies have minimums for certain sized homes, making their prices less economical. So, if your place, say a decently-sized apartment, is messed up, then you can expect to pay anywhere from $200 to $350. Is It Worth Renting a Cleaning Service? Your landlord will clean your place if need be. Then he or she will take the price of the cleaning out of your rental deposit. The price for your landlord to clean your place will be higher than for you. Why? Because your landlord has no incentive to find cheap cleaning service — you’re the one paying the bill. Of course, you don’t have to hire a cleaning service. You can always try to clean a bit yourself. Here’s how to clean a place before moving out.